Are you in some situations that you need convert the Excel to image fretfully as you can not upload the Excel to website? Is that occurred to you that you can not show your Excel together with other document? If you have suffered this kind matter, now you will find a relief in this article. I will show you how to convert Excel to image in three seconds. Take converting xls to bmp for example to show you how to make it. Roughly I divide the conversion to four steps. First, free download a software named docPrint Pro. Please allow me to say one or two words about docPrint Pro. It is either a printer driver or a file format converter. When you use it as printer driver, it can help you save a lot of ink, paper and precious time. 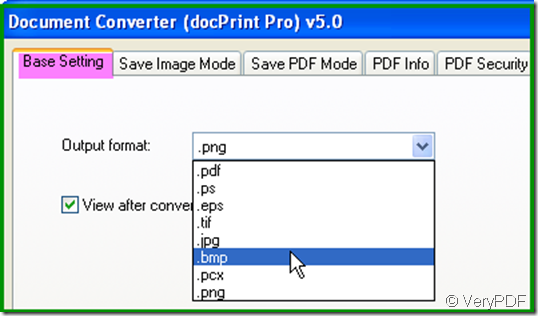 When you use it as a converter, it can convert all the printable file to image or PDF file. It also allows you to edit the property of converted file. If you would like to know more about it, please click here to visit its website. Second, add file to docPrint Pro. As we need to convert xls to bmp, source file should be added first. I will illustrate it by a picture. Three way for adding files have been marked in the picture. You can choose any one of them as you wish. Third, set output file format and image property. Click the button “setting” then you find a newly bounced option box. There are five sub labels, please go to the first one named “Base setting”. There is a drop list option box, click it to choose bmp as output file format. Then it will convert xls to bmp. Meanwhile if you need adjust the image color depth and color resolution, please go to “Save image mode”sub label. The last step is do the conversion. Click the button start, then the conversion will process automatically. But in this step, you need to choose a folder or a place to save the converted bmp file. A few seconds later, you will know the conversion from xls to bmp done by you is successful. Please do not hastate ,if you need to convert Excel to image, to have a free trail of docPrint Pro. Wonder can be created by yourself. If you have any further questions, please feel free to email us at support@verypdf.com. How to print webpage to eps file? This entry was posted in docPrint Pro and tagged docPrint Pro, Excel, Excel to image, xls to bmp. Bookmark the permalink.